Clayton Kershaw is a great pitcher — he’s won two Cy Young Awards; threw a no-hitter on June 18; plus allowed a grand total of 4 earned runs while striking out 48 and walking 2 this month coming into today. The Cardinals offensive struggles are continuing, as they’d scored just 4 runs on 18 hits while striking out 28 times in the first three games in this Dodgers series, so today was going to be a tough challenge anyway. Yes, the Cards beat Clayton Kershaw twice last October in the National League Championship Series — which mattered not at all today. 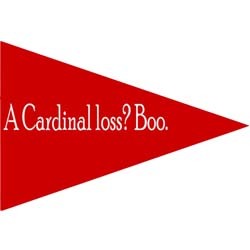 Updated Cards totals for the series: losers of 3 of 4 games, 4 runs, 21 hits, 41 strikeouts. But at least Jorge Rondon finally got to make his MLB debut — third call-up is the charm. This entry was posted in 2014 Cardinals and tagged Clayton Kershaw, How many strikeouts?, Jorge Rondon, Los Angeles Dodgers by Christine Coleman. Bookmark the permalink.